Trendease International · July 2004 / What’s hot this summer? July 2004 / What’s hot this summer? Hermes: A day at the races. Breaking away from the masses, diversity, and customization are recurring themes today. Customers crave differentiation whether it comes in the form of fashion accessories and clothing, perfume, drapery, furniture, architecture, cars - the gamut of product categories. This month we are delivering fresh articles and over 500 images to your screen where companies are meeting the needs of changing market demands. Experience the ‘silent sellers’ at Harvey Nichols, picnic with Hermes, crash for the night at Nuits Blanches, accessorize with Swatch, dine with Creso, and experience furniture surgery by the Design Academy Eindhoven. There is more inside this issue, including zany prints and crafty products. Chantilly — Let the races begin! Le Grand Prix de Diane hosted by Hermes is the French equivalent of the British Ascot. 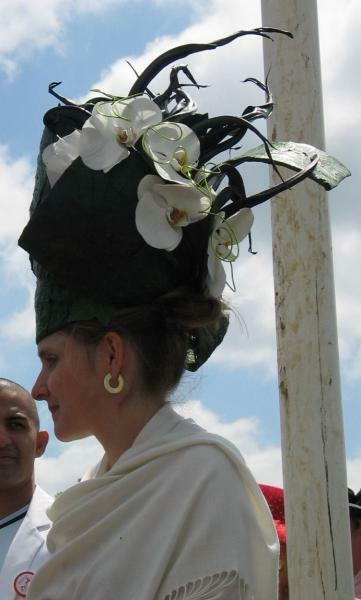 This day of horse races and socializing takes place annually at Chantilly, outside of Paris. Not only was it a beautiful summer day for watching the finest thoroughbreds galloping along the track, but also for viewing interesting attire, not to mention extravagant hats. Here’s betting that you will enjoy this gallery. Rotterdam — This year at the 100% Design Show in Rotterdam, students of the Design Academy Eindhoven got a taste of what it means to be a designer as they worked with Dutch furniture manufacturer, Label Produkties BV, to revamp some of their classic designs. London — Windows are the most effective way to communicate a store’s essence or brand. Harvey Nichols, one of London’s largest and most reputed luxury department stores, is impossible to walk past without stopping to gaze at their displays that light up the corner of Knightsbridge and Sloan Street. See over 100 window display images in this gallery. Milan — We are so accustomed to mass marketing, that it has almost eclipsed the fact that for centuries, customers were served individually. These days, the need for conformity through uniformity is losing its appeal. Swatch, one of the world’s most recognizable brands, has tapped into the demand for one-to-one marketing by developing an exclusive line of tailor-made watches. Talk about keeping up with the times! Rotterdam — Have you ever had trouble booking a room at a hotel for a trade event? When every room within a 10-mile radius of the show is full? Sacha Winkel and Sophie Krier might be able to suggest another option. The Nuits Blanches venture is their “sweet revenge” on impersonal hotel chains, providing alternative lodging for the trade fair traveler. Milan — Elegant and international sophistication for the home is what you will be able to find at the Creso Gallery. Valeria Corazza, the proprietor, has collected distinguished pieces from around the globe; objects crafted by skillful artisans who practice time-honored methods that are appreciated today. London — Can you imagine a twenty-five meter long repeat? Not only has Nigel Atkinson managed to execute this seemingly impossible feat but he also produces some of the most elegant and unique textiles that can be found in the world today. Milan — This year Zanotta is celebrating its fiftieth anniversary. A leader in Italian industrial design since 1954, the company has been an enduring source of contemporary design, progressive ventures and artistic events. The founder, Aurelio Zanotta, collaborated with visionaries, anticipated future trends in living, and harnessed new technologies to develop first-class designs that have lasted through the decades. Multiple European Cities — The Webster’s International Dictionary says that ‘to craft’ is “to make or produce with care, skill, or ingenuity.” Many of the designs in this gallery have been made by hand, or appear handmade, pieced together in patchwork designs, hand-knit or crocheted. Multiple European Cities — Last month, we showed you stripes. This month, we are bringing you audacious prints and patterns. We found them in the shops; we found them on the streets. We even found them in the London Underground. From tiny repeats to graphics, it seems as if everyone is jumping on this bandwagon. London — At London’s Olympia Exhibition Center, the Daily Telegraph / House & Garden Fair 2004 showcased 450 leading companies in the fields of design, interiors, gardens, shopping, travel and gourmet food and wine. This annual event is an essential destination for consumers who are looking for inspirational ideas for the summer season and beyond. This gallery displays the highlights of the show along with this week's tidbits. Paris — This week we bring you a cutting-edge gallery featuring the new rug designs from the French designer Philippe David. David has collaborated and worked with Lanvin and Sam Laik in Paris; Rubelli in Venice; Fujie Textile in Tokyo; Donghia, Clarence House, and Yves Saint Laurent in New York. View some of his current designs and sneak previews to new ones here and read this week’s tidbits. London — The Senior Editor of Fashion for Home Furnishing News (HFN), Michael Devine, asks, “Is green the new gray? Or is blue next year’s green? Where does one go to find the answers to such baffling and important questions when planning the season?” Trendease is honored to be in this week’s HFN trend section. This week’s gallery features a color palette we have been tracking in London. It translates well from fashion to the walls to the floor to the table to the bathroom to the top of bed. New York — Designers and merchandisers flock to the European PreView in New York City to view the textile trends for upcoming seasons. Be one of the lucky few to get a sneak peak at “the world’s most creative and innovative textiles” months before the main European trade shows. “Find your own path” with this special gallery feature. Multiple Turkish Cities — We visited the Turkish Fashion Fabric Exhibition organized by the Istanbul Textile and Apparel Exporters’ Association (ITKIB) to scope out the latest trends in textiles for fall and winter 2005-2006. This gallery features swatches and trend boards from the show. Also read our Turkish tidbits. London — We went to check out a retrospective of some of the century's best-designed chairs at the Design Museum in London. The exhibition featured the evolution of contemporary seating and some of the world's best known designers and collector's pieces. Have a seat and see which designs still hold their own today and check out the latest tidbits.